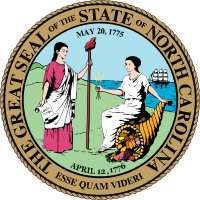 The Governor shall procure of the State a Seal, which shall be called the great seal of the State of North Carolina, and shall be two and one-quarter inches in diameter, and its design shall be a representation of the figures of Liberty and Plenty, looking toward each other, but not more than half-fronting each other and other-wise disposed as follows: Liberty, the first figure, standing, her pole with a cap on it in her left hand and a scroll with the word "Constitution" inscribed thereon in her right hand. Plenty, the second figure, sitting down, her right arm half extended toward Liberty, three heads of grain in her right hand, and in her left, the small end of her horn, the mouth of which is resting at her feet, and the contents of the horn rolling out. The background on the seal shall contain a depiction of mountains running from the left to the right to the middle of the seal. A side view of a three-masted ship shall be located on the ocean and to the right of Plenty. The date "May 20, 1775" shall appear within the seal and across the top of the seal and the words "esse quam videri" shall appear at the bottom around the perimeter. No other words, figures or other embellishments shall appear on the seal. The date of May 20, 1775, refers to the Mecklenburg Declaration of Independence, allegedly the first declaration of independence adopted during the American Revolution. The motto " Esse quam videri" means "To Be Rather Than To Seem." The "pole with a cap" is a liberty pole.